An AI vision company is launching a wearable camera for tracking your relationships. If that sounds creepy… well, it sort of is. And if it sounds useful, it might be that, too. It’s a device that seems almost custom-built to tap into our fears about how technology will change relationships. And it almost certainly won’t be the last of its kind. 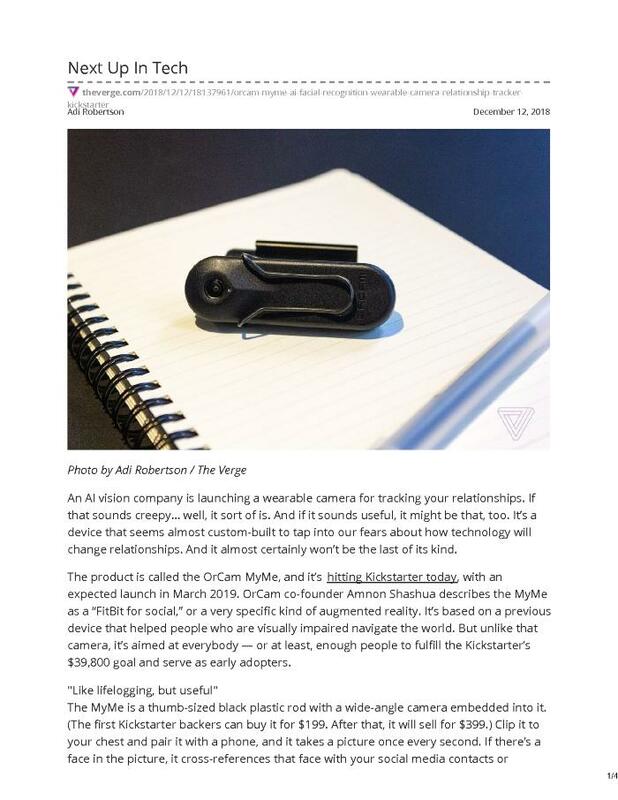 The product is called the OrCam MyMe, and it’s hitting Kickstarter today, with an expected launch in March 2019. OrCam co-founder Amnon Shashua describes the MyMe as a “FitBit for social,” or a very specific kind of augmented reality. It’s based on a previous device that helped people who are visually impaired navigate the world. But unlike that camera, it’s aimed at everybody — or at least, enough people to fulfill the Kickstarter’s $39,800 goal and serve as early adopters.